Most gold prospecting takes place in the wilds meaning that you are likely to encounter wild animals as you are prospecting. Snakes of North Carolina, South Carolina and Georgia: A Guide to Common and Notable Species and it was written by Timothy J. Walsh, George Heinrich. This edition of Snakes of North Carolina, South Carolina and Georgia: A Guide to Common and Notable Species is in a Pamphlet format. This books publish date is July 31, 2011 and it has a suggested retail price of $7.95. It was published by Quick Reference Pub Inc and has 12 pages in the book. Know your snakes before you prospect for gold or metal detect! 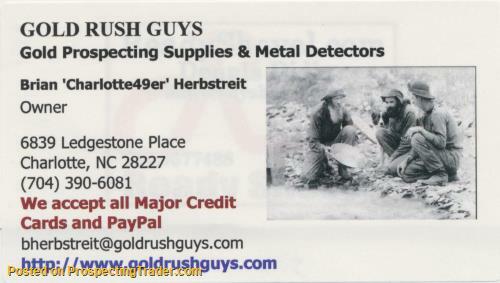 Gold Rush Guys have many Metal Detecting, History & Gold Prospecting Maps, Books & Videos. Many of these are out-of-print or out of production!